The medial deltoid ligament is the primary stabilizing structure in the ankle joint following lateral malleolar fracture. However, medial deltoid ligament ruptures are difficult to diagnose using current imaging modalities. We hypothesized that ultrasonography can be used to accurately allow early clinical assessment of ankle fracture stability, thereby negating the need to perform plain film stress views of the acutely injured ankle. This prospective study included 12 patients (age range, 18–72) with supination external rotation fractures requiring operative fixation. Following induction of anesthesia, ultrasonography examination was performed, followed by an arthrogram under fluoroscopic screening. Radiographs, ultrasonography, and arthrographic findings were compared. There was 100% correlation between ultrasonography and arthrogram findings. Ultrasonography accurately diagnosed medial deltoid rupture with a sensitivity of 100% and specificity of 100%. Plain film radiographs of the ankle had a sensitivity of 57.1% and a specificity of 60%. The difference between these was significant (χ2=.0091). This study demonstrates diagnostic ultrasonography to be an accurate diagnostic modality in assessing medial deltoid ligament integrity in patients with supination external rotation fractures. It offers the same sensitivity and specificity as arthrography without the need for additional invasive procedures. Its relative ease of use and lack of ionizing radiation make it a potentially useful tool, particularly in a busy trauma service. Drs Henari, Banks, Radiovanovic, Queally, and Morris are from the Department of Trauma and Orthopedics, Adelaide and Meath Hospital, Dublin, Ireland. Drs Henari, Banks, Radiovanovic, Queally, and Morris have no relevant financial relationships to disclose. Correspondence should be addressed to: Shwan F. Henari, MCh, MRCSI, Midland Regional Hospital at Tullamore, Trauma and Orthopedic Surgery, Arden Rd, Tullamore, County Offaly, Ireland (shwanhenari@hotmail.com). A variety of imaging modalities have been used to diagnose deltoid ligament rupture. Studies have shown that ecchymosis, swelling, and tenderness are not reliable signs of deltoid ligament rupture.12–14 Schuberth et al15 demonstrated deltoid ligament integrity cannot be reliably predicted by the medial clear space on radiographs of displaced lateral malleolar fractures. Manual and gravity stress radiographs have shown good reliability,16–19 but these are painful to perform on the acutely injured patient. Both scenarios are not ideal for a busy trauma service. Magnetic resonance imaging (MRI) is highly reliable in evaluating medial deltoid ligament integrity.20 However, this is an expensive and time-consuming tool that does not allow early decision making in busy trauma services. Arthroscopy has been used and described as the gold standard for assessing deltoid ligament injury,15 but this is an operative intervention. Ultrasonography is a safe, portable tool that can be used in an emergency department and trauma clinic. The purpose of this study was to assess the accuracy of ultrasonography as a method of diagnosing deltoid ligament injury, thereby differentiating between stage II and stage IV supination external rotation ankle fractures. Study approval was obtained from our institutional ethics committee. During a 4-month period, patients with isolated lateral malleolar fractures that required surgery were recruited prospectively. This was not a consecutive series, as the primary author (S.H.) was not always available to perform the ultrasonography. All patients had given informed consent prior to enrollment in the study and were approached on admission to hospital. Inclusion criteria included all patients >18 years who had isolated lateral malleolar fractures and underwent operative fixation. Exclusion criteria were patients with injuries that had occurred >48 hours before examination, non-English speaking patients, and patients who had renal impairment or allergies to contrast. Plain radiographs (anteroposterior, lateral, and mortise views) were reviewed immediately after injury by the responsible operating surgeon who did not have a role to play in the study. A decision for operative fixation was made based on the plain radiographs. The deltoid ligament was considered ruptured if the medial clear space was >4 mm or was 1 mm greater than the superior joint space, or if lateral talar subluxation was present.12 If the deltoid ligament was considered ruptured according to these criteria or if there was significant displacement of the fibula, the patient was offered the option of operative fixation as per institutional protocol. The primary author (S.H.) was blinded to the patient’s plain radiographs prior to performing ultrasonography. After induction of anesthesia and prior to tourniquet inflation, ultrasonography was performed on the injured ankle. All ultrasonographies were performed by the primary author, who completed a 3-day musculoskeletal ultrasonography course prior to the study. To assess competency, the primary author performed a number of ankle soft tissue ultrasonographies under the supervision of an experienced ultrasonographer. A Sonosite Titan Portable Ultrasonography machine (Sonosite, Bothel, Washington) with a standard 4-mm probe was used. 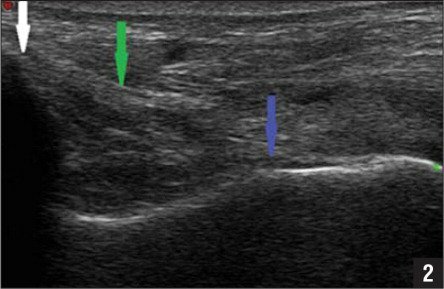 The ultrasonography was conducted by placing one end of the ultrasonography probe (4 cm) on the tip of the medial malleolus with the distal end of the ultrasonography probe anterior to the coronal plane. With the proximal part of the probe held fixed, the distal end of the probe was rotated posteriorly, allowing full visualization of the deltoid ligaments (Figure 3). Ultrasonography finding of complete disruption of the normal linear pattern of ligamentuous fibers was taken to signify deltoid rupture. The status of the ligament was documented prior to arthrography. Figure 3: Diagram showing the deltoid ligaments. The limb was then sterilized and draped, and a tourniquet was applied. Under fluoroscopic screening, 4 mL of radiopaque contrast mixed with 16 mL of normal saline was injected into the joint, and continued screening allowed determination of deltoid injury. Rapid and significant extravasations of the contrast outside of the capsule on the medial side was taken to imply significant disruption of the deltoid ligament as anything less than significant disruption would lead to the contrast exiting through the lateral malleolar fracture (the path of least resistance). The results of the arthrogram, ultrasonography, and plain films were compared. Descriptive statistical analysis and receiver operating characteristic (ROC) analysis were used to analyze the data. During the 4-month study period, there were 16 isolated lateral malleolus fractures in adults requiring operative intervention. Twelve patients (8 men and 4 women) consented to the study. Average patient age was 41 years (range, 18–72 years). Indications for surgery were talar shift/angulation, displaced lateral malleolar fractures, or both. All patients underwent open reduction and internal fixation, consisting of an interfragmentary compression screw and a lateral neutralization plate and screws. None of the patients had surgery to the medial side; none required a syndesmosis screw, and none had a posterior malleolar fracture. Regarding assessment of deltoid ligament integrity, arthrography was considered to be the gold standard.21 Arthrography demonstrated that 7 of the 12 patients had complete deltoid ligament rupture (prevalence, 58.3%). Review of the radiographs for widening of the medial clear space at the time of injury yielded a true positive of 4 cases and false negative of 3 cases, for a sensitivity of 57.1% (confidence interval [CI], 18.4%–90.1%) and a specificity of 60% (CI, 14.7%–94.7%). Ultrasonography of the ankle (Figures 1, 2) yielded 7 true positive findings and 5 true negative cases, for a sensitivity of 100% (CI, 59%–100%) and a specificity of 100% (CI, 47.8%–100%). Comparison of the diagnostic methods using ROC analysis (0.59 for plain radiographs and 1.00 for ultrasonography) demonstrated a significant difference between the 2 diagnostic modalities (χ2=.0091) (Table). Figure 1: Ultrasonogram showing a disrupted deltoid ligament with the probe in the coronal plane. The white arrow indicates the medial malleolus, the blue arrow indicates the talus, and the red arrows indicate the disrupted deltoid ligament (A). Radiograph showing the same injury (B). Figure 2: Ultrasonogram showing an intact deltoid ligament with the probe in the coronal plane. The white arrow indicates the medial malleolus, the blue arrow indicates the talus, and the green arrow indicates the intact deltoid ligament. Differentiation between stage II and stage IV supination external rotation injuries as defined by Lauge-Hansen5,22 is of clinical importance. In stage II injuries, the intact deltoid ligament stabilizes the ankle mortise, allowing the undisplaced fibular fracture to be treated nonoperatively.13 In contrast, stage IV injuries, in which either the medial malleolus is fractured or the deltoid ligament is ruptured, require operative fixation due to an unstable ankle mortise. The use of widening of the medial clear space on plain radiographs as an indicator of deltoid ligament integrity also has been shown to be unreliable, as controversy exists on what represents pathologic widening, with studies reporting abnormal figures to be between 4 and 5 mm.12 Stress radiographs have been shown to be more useful than plain radiographs alone if clinical findings also are taken into consideration.12 Gravity stress radiographs are as reliable as manual stress radiographs17–19; however, they are not accurate. In a study comparing arthroscopy to manual stress views, Schuberth et al15 demonstrated medial clear spaces ≥4, 5, and 6 mm had false-positive rates of 53.6%, 26.9%, and 7.7%, respectively. Koval et al20 observed that 19 of 21 patients (90%) who had a positive manual stress radiograph (medial clear space .5 mm) had evidence of only a partially torn deep deltoid ligament on MRI. Thus, widening of the medial clear space is not reliable as an indicator of deltoid rupture. Similarly, a normal medial clear space on plain radiographs does not indicate an intact deltoid ligament. In our study, 3 patients (21%) had a ruptured deltoid ligament at arthrography despite having a normal medial clear space on plain radiographs. These patients all had shortened and displaced lateral malleolus. Limitations of our study include the small number of patients enrolled in the study. Only 1 operator performed and interpreted the ultrasonographies, which did not permit calculation of interobserver reliability. In addition, although the findings of the ultrasonography were documented prior to performing the arthrogram, the ultrasonography operator was not blinded to the results of the arthrogram. Finally, we acknowledge the most accurate method of assessing deltoid integrity is by exploration; however, this was felt to be ethically unacceptable, and although MRI would be preferable to arthrogram, this modality was not readily available within the constrained time frame. Nonetheless, this study demonstrates the accuracy of ultrasonography in assessing deltoid ligament integrity in supination external rotation fibular fractures, and this may prove a useful adjunct in assessing the stability of ankle fractures in the future. Although further study is required, especially in assessing individual components of the deltoid ligament and their incidence of rupture, ultrasound proved more accurate than plain radiographs in this study. As the incidence of ankle fractures increases in the context of an aging population,23,24 the importance of a reliable, simple, and early diagnostic tool to allow correct and prompt diagnosis of these fractures will only increase. Although further study and trials are required, we have shown that with training, ultrasonography is an accurate tool for deltoid ligament assessment. Ultrasonography of the acutely injured ankle should be considered as a potential imaging modality that can be used in busy trauma units to help expedite clinical decision making. Michelson JD. Fractures about the ankle. J Bone Joint Surg Am. 1995; 77(1):142–152. Harper MC. The deltoid ligament: an evaluation of need for surgical repair. Clin Orthop Relat Res. 1988; (226):156–168. Pankovich AM. Fractures of the fibula at the distal tibiofibular syndesmosis. Clin Orthop Relat Res. 1979; (143):138–147. Lauge-Hansen N. Fractures of the ankle, II: combined experimental-surgical and experimental-roentgenologic investigations. Arch Surg. 1950; 60(5):957–985. Michelsen JD, Ahn UM, Helgemo SL. Motion of the ankle in a simulated supination-external rotation fracture model. J Bone Joint Surg Am. 1996; 78(7):1024–1031. Port AM, McVie JL, Naylor G, Kreibich DN. Comparison of two conservative methods of treating an isolated fracture of the lateral malleolus. J Bone Joint Surg Br. 1996; 78(4):568–572. Harper MC. The short oblique fracture of the distal fibula without medial injury: an assessment of displacement. Foot Ankle Int. 1995; 16(4):181–186. Harper MC. 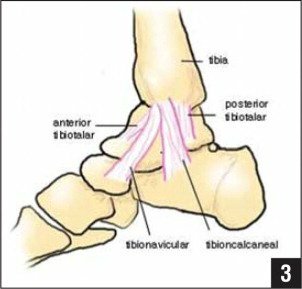 Deltoid ligament: an anatomical evaluation of function. Foot Ankle. 1987; 8(1):19–22. Tornetta P III, . Competence of the deltoid ligament in bimalleolar ankle fractures after medial malleolar fixation. J Bone Joint Surg Am. 2000; 82(6):843–848. McConnell T, Creevy W, Tornetta P III, . Stress examination of supination external rotation-type fibular fractures. J Bone Joint Surg Am. 2004; 86(10):2171–2178. Egol KA, Amirtharajah M, Tejwani NC, Capla EL, Koval KJ. Ankle stress test for predicting the need for surgical fixation of isolated fibular fractures [published corrections appear in J Bone Joint Surg Am. 2005; 87(1):161 and J Bone Joint Surg Am. 2005; 87(4):857]. J Bone Joint Surg Am. 2004; 86(11):2393–2398. Lauge-Hansen N. Fractures of the ankle, III: genetic roentgenologic diagnosis of fractures of the ankle. Am J Roentgenol Radium Ther Nucl Med. 1954; 71(3):456–471. Kannus P, Parkkari J, Niemi S, Palvanen M. Epidemiology of osteoporotic ankle fractures in elderly persons in Finland. Ann Intern Med. 1996; 125(12):975–978.